One my my dedications to my father. 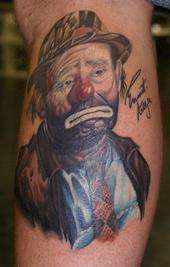 This tattoo of EMMETT KELLY was done by BRIAN McCRONE of NORTH COAST BODY MOD in Mentor Ohio. I used to buy my father Emmett figurines every year for FATHERS DAY. When he passed away...I decided to continue the collection for my kids. really nice work, awesome art work, and great colors. Wow I love this great tattoo 10 all the way.